When I visited Auckland for work back in November, I stopped by Melbourne on the way back since it was significantly cheaper to fly on Qantas than on Singapore Airlines in Business Class. Besides, there is always something to do (or eat!) in Melbourne and spending time here sure beats spending the weekend in the sleepy city of Auckland. Since I was not traveling on Emirates in Business Class this time, I did not have a complimentary chauffeur-drive service in Melbourne but getting an Uber ride was relatively easy and the trip costed just AUD 50. There are obviously cheaper options like the Skybus but I was not really in the mood for sharing that afternoon. Click HERE to check out the InterContinental Melbourne The Rialto! I have been to Melbourne at least ten times now (I went to school in Brisbane and spent plenty of weekends here in Melbourne because there was just so much more to do) and honestly, I have not actually noticed the InterContinental Melbourne The Rialto previously - I knew it existed but I just wasn't sure where it was. Room rates were pretty high the weekend that I was visiting so I decided to make use of my InterContinental Ambassador Free Weekend Night Certificate (read all about the upcoming changes to this paid membership here!) on this stay. The stay worked out to under AUD 500 for two nights which is a great price for a busy weekend in Melbourne. Located on Collins Street, the InterContinental Melbourne The Rialto is located in the beautiful Rialto Building (built back in 1885) that is famous for its Venetian Gothic architecture. Restoration works were on-going during my stay so I was unable to take a nice shot of the building from the outside but the lobby is stunning! There is a dedicated check-in area for InterContinental Ambassadors here at the InterContinental Melbourne The Rialto (even though I am not sure if they actually turn anyone away who isn't one) so I proceeded there immediately. Anna, who checked me in to the hotel was delightful and she even offered me a choice of gift (for Ambassador members) - I settled for a beautiful InterContinental bookmark. My initial booking was made for a Deluxe Room but consistent to InterContinental Ambassador benefits, I was given a one-category upgrade into an Executive Room. The Executive Room that I was assigned to was located on the highest floor of the building and upon exiting the lift, I realised that it was actually an InterContinental Ambassador floor. The Executive Rooms here at the InterContinental Melbourne The Rialto range from 28-36sqm in size and if I were to guess, the room that I was assigned to probably had 36sqm of space since it felt quite roomy. There is a small lounge chair towards the back of the room and the natural daylight makes it a great stop to cuddle up with a cup of coffee and a good book. As mentioned earlier, I chose the InterContinental bookmark as my InterContinental Ambassador (find out about the upcoming changes to this programme here!) gift and shortly after I have arrived in my room, a fruit basket as well as a bottle of sparkling water was delivered to my room. Interestingly enough, this bottle of water was in-house branded while the other bottles of drinking water in the room were Fiji-branded (it is usually the other way around). Even though I was not here in Melbourne for work, I appreciated the existence of a large desk which makes it possible to get things done. Complimentary WiFi is available for hotel guests and it worked without a hitch. While I do not typically feel the need to mention this but after spending a week in Auckland where my internet was capped at 1GB per day, I feel obliged to mention that hotel guests here at the InterContinental Melbourne The Rialto are able to enjoy unlimited streaming WiFi for the duration of their stay. 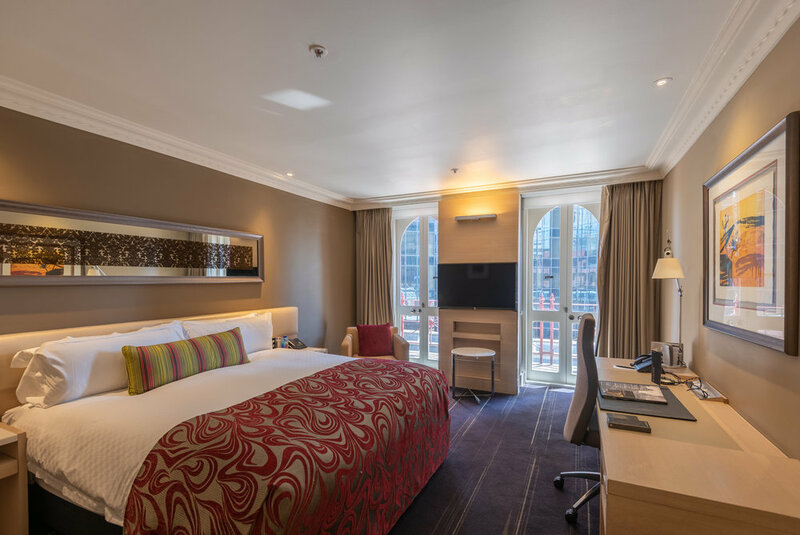 While the bedroom of the Executive Room is not exceedingly big, it has everything you require regardless of whether you are here for business or pleasure. There is an ironing board and iron located in the wardrobe and the room is spacious enough so you do not feel claustrophobic. While the décor is slightly dated in my opinion, it is still one of the better-looking hotels here in Melbourne. Now if only Melbourne was not located 3,700 miles away from Singapore - the beds here at the InterContinental Melbourne The Rialto are phenomenal! In fact, the hotel probably knows since you can find brochures located around the property regarding the sale of these beds. I cannot quite remember what the brand of mattress is (it isn’t one of the big brands like Sealy or Serta that hotel chains typically use) but if people are interested enough, I will definitely reach out to the hotel to find out. Honestly, I spend close to 100 nights in hotels each year so it is not easy to impress me as far as a bed is concerned but these beds are truly spectacular and that alone is a good enough reason to stay in this property! There is a sizeable wardrobe here in the Executive Room but unfortunately for me, the sliding door does not shut completely. While that does not sound like a huge problem, the existence of a gap in between the door and the side of the wardrobe meant having the light on inside even at night. I personally love sleeping in pitch darkness so the light definitely bothered me but thankfully, I managed to devise a creative way (with tape) to manually push the button inside of the cupboard so the light switches off (that amazing bed definitely helps too). You will find a coffee machine here in your bedroom (which is great for coffee-lovers like me) but since you are here inn Melbourne, a city that is well-known for incredible flat whites, you should definitely be getting your caffeine fix outside and not in the hotel. If you really do not have time to stray, the Club InterContinental Lounge serves delicious coffee and honestly, I am starting to believe that good coffee is the only way a hotel can remain profitable in this city. TWG-branded teabags are provided in the room and I particularly appreciate the organic sencha which is placed and replenished here. The bathroom of the Executive Room is probably my least favourite area in the whole hotel. You will not find a bathtub here in this room type and it actually looks rather sparse. While it is quite spacious and you do have everything you need here in this bathroom, the space was purely functional for me. Like all other InterContinental hotels that I have been to in recent years, bath amenities are provided by a premium aromatherapy company from America, Agraria. As I have mentioned on multiple occasions in previous reviews of InterContinental-branded properties, the scent does not appeal to me since it reminds me vaguely of dishwashing liquid but it does its job. In any case, you can always purchase your own shampoo and body gel if required - you can even get them from chemists nearby! While the name of the room that I stayed in could be slightly misleading, I think it is important to clarify that the Executive Room here at the InterContinental Melbourne The Rialto does not come with Club InterContinental Access - it was a supplement that was added to my reservation when I checked-in. In any case, I was glad that I had access to this beautiful space that serves not only breakfast but also afternoon tea as well as cocktails and canapés in the evening. What I love most about the Club InterContinental Lounge is the private balcony that is attached to it. While it was slightly chilly when I visited, I really enjoyed the natural breeze and sunshine when I sat here in this beautiful space. The balcony is not particularly huge and it could probably only accommodate six guests (if they are seating) so make sure you come early (slightly ahead of meal periods) if you would like a seat here. Club InterContinental guests here get to enjoy evening drinks and a Chef’s Tasting Plate from 5:30PM to 7:30PM daily. From what I understand, children are not allowed in the lounge during these two hours so you do not have to worry about screaming kids while you enjoy a glass of wine. The canapés were quite good and there is even a small buffet section if you would like something more. Honestly, you will probably need to get a proper dinner after this unless you are a tiny eater. 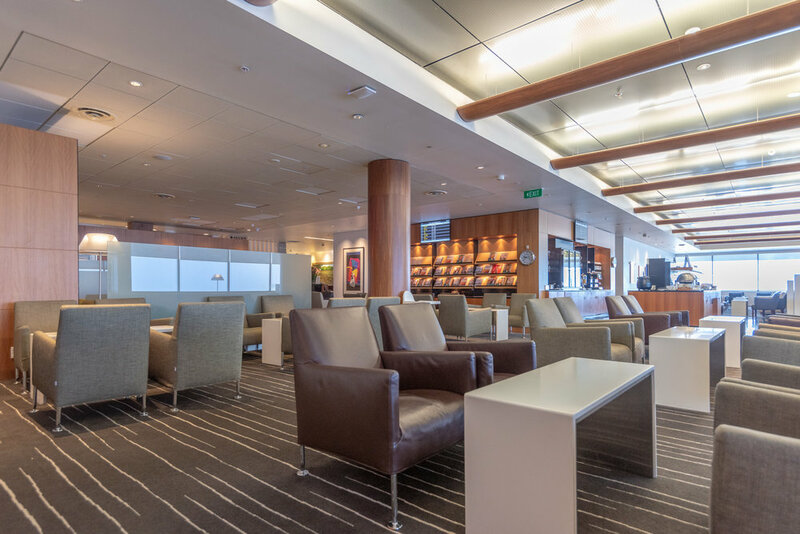 If you are afraid of the cold (or the heat in the summer), there are quite a number of seats located within the Club InterContinental Lounge itself. There is even a small working station located towards the end of the lounge and since I actually managed to get last-minute tickets (from scalpers unfortunately) to see Passengers live, having a printer where I could print out the e-ticket (for free) helped a lot! Even though I really wanted to spend my last night in Melbourne in places that I would typically revisit, I could not pass up the chance to see Passengers (especially in a relatively small venue) and he was amazing! The next morning, I had the option of having breakfast at the Club InterContinental Lounge or the beautiful Alluvial Restaurant downstairs which looks up to that iconic atrium that is one of every Instagrammer’s favourite spot here in Melbourne. Since I already have lunch plans and I did not wish to overeat, I decided to check out the spread at the lounge instead. What really impressed me were the eggs benedict which were done beautifully - guests who enjoy breakfast in the Club InterContinental Lounge will be able to order from an a la carte menu which has plenty of breakfast favourites. Even though I typically stay at the Pan Pacific Melbourne whenever I visit (since I have been staying there since I was studying in Australia), I think it is safe to say that the InterContinental Melbourne The Rialto has managed to find its way up my list of preferred hotels to stay in. The property may not be right smack in the city but I really appreciate the peace and quiet that you get with this part of town - you always hop on a free tram to get around as well. Until the W Melbourne opens in 2020, the InterContinental Melbourne The Rialto is a great choice for luxury travellers seeking for quality accommodation in the city of Melbourne.